I confess this is my favorite vintage ensemble. The brocade coat with 3/4 length fur trimmed sleeves is one of the very few pieces from my childhood collection that survived. Finding that coat was the inspiration for my initial interest in vintage collecting. The tag for this ensemble is found in the coat. The hanky is very hard to find and the fur headband can be hard to find with all of the pearls intact. The aqua corduroy purse is easily found - but difficult to find in mint condition. The dress and coat are fairly easy to find, as this ensemble was produced for 5 years and the brocade fabric holds up very well over the years. The area most likely to show wear is the fur trim on the coat. 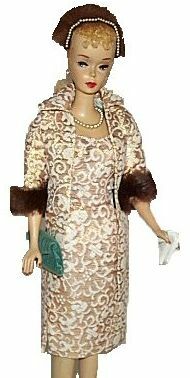 Mattel issued an Evening Splendor reproduction in 2005.